【Description】: Discover the elegance of olden days and learn the secrets of needlework crafts in Romania. In our days there are very few occasions when one can experience the warmth and beauty of handmade cloths stitched with splendid embroideries. This tour was designed for those willing to discover one of the richest cultural treasures of Transylvania and Maramures, needlework. learn various needlework techniques from the locals. mingle with the villagers: attend a Sunday mass at a Church. discover the cultural diversity of Transylvania by visiting both Hungarian and Romanian villages. enjoy traditional foods and have lunch with home-made dishes. visit the only Merry Cemetery in the world. pick up/drop off from/to your hotel in Bucharest. private car/minivan, with English speaking driver. all activities and entries according to program. lunch with typical Romanian dishes. accommodation in a superior hotel in Cluj-Napoca. Arrival at Cluj Napoca International Airport. Our team will meet you at the airport. Transfer to the hotel. Visit Meszoseg area, namely Sic village. See people in traditional costumes going to the church. Lunch at a local house with traditional dishes. Needlework workshop. Return to Cluj Napoca. Dinner. Breakfast at hotel. Visit Macau and Mera villages, in Kalotaszeg region, where Hungarian traditions are still very well preserved. Lunch at a local house, then enjoy the afternoon by learning about local embroidery techniques and traditional patterns. Return to Cluj Napoca in the evening. Dinner at a local restaurant in the city centre. Breakfast at hotel. Departure to Huedin to see the local market where Romanian and Hungarian villagers sell antique cloths embellished with traditional embroideries. Visit the Protestant Church• and admire the embroideires then continue to Sighetu Marmatiei. On the way visit Șurdești Wood Church•, a UNESCO WORLD HERITAGE. Check-in and Dinner. In the morning visit the Merry Cemetery•. 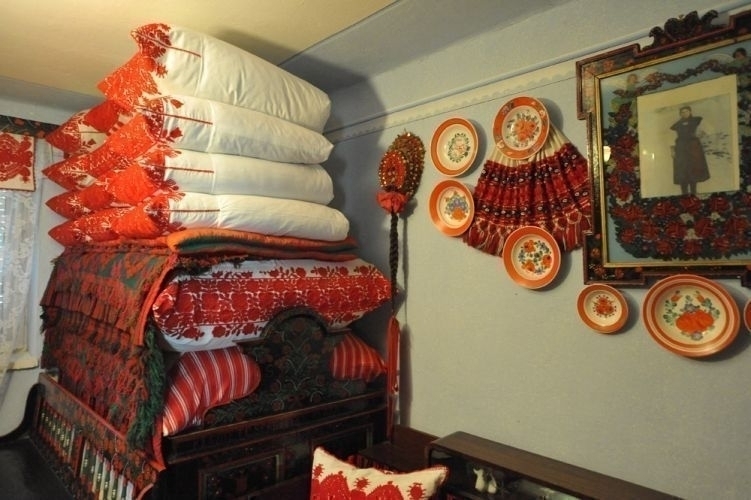 Drive to Tisa village to visit Maria Pipas House•, here you will see the biggest private collection of embroideries in Romania. Return to Sighet. Dinner at a local restaurant. Transfer to Cluj Napoca Airport in the morning and departure.